was- A tribute to dad. This was the artwork features this month. 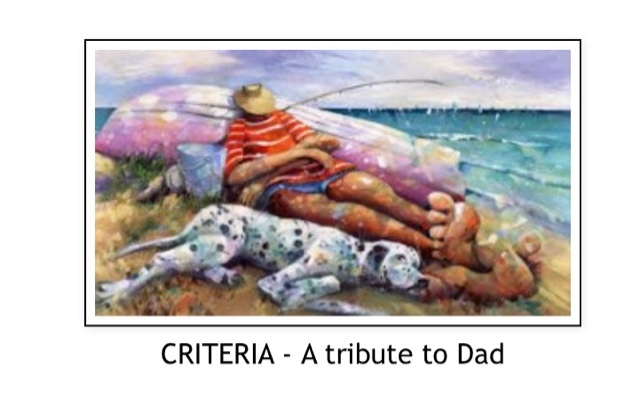 This is a great image tondraw inspiration from. Living here on the Gold Coast we are surround by beaches, and sown a lot of time there. On Father's Day this year we went to the beach and I had my camera with me and was able to snap some great pics of my boys. So I decided one of these photos suited this image perfectly. So here is my layout. I love using mixed media on layouts- mist, paint, ink, you name it. 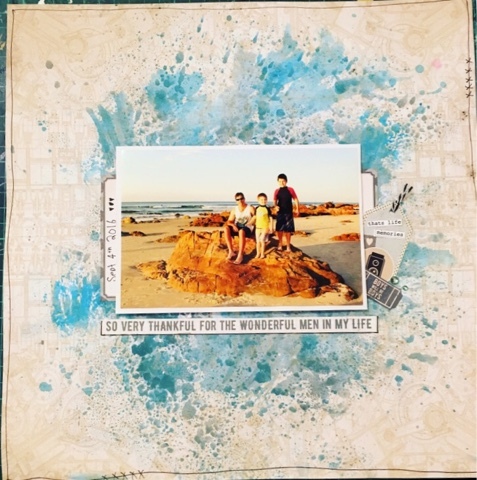 I wanted the blue to stand out the most on this layout- to toe in the boys and the beach theme to the pic. So I hope you've liked this layout and the challenge- check it out, it's a good one. Totally delightful Chrissi. Thank you for sharing with us on ARTastic. Loving your background Chrissi. Thank you so much for joining us at ARTastic this month. Love it! That bg really works a treat with our ARTastic challenge this month....& your 'beach' photo is FABULOUS too:) So nice to seeing you playing along here with us at ARTastic!!! Great background work! Perfect photo for the layout too. Thanks for creating with us at ARTastic! Oh, I like this spray! And gorgeous colors! Thanks a lot for joining us at ARTastic! Wonderful photo and I love the background you have created. Well done on a great page. Thanks for taking the time to join in our challenge at ARTastic this month. Pretty page. Love the mixed media look. Thanks for joining us at ARTastic blog for September. Great take on the challenge! Love this layout! Thanks for joining us at ARTastic!